A very elegant fine white "fil de lin" linen envelope that was certainly created to be placed elegantly on a bed with a fine nightgown tucked inside. 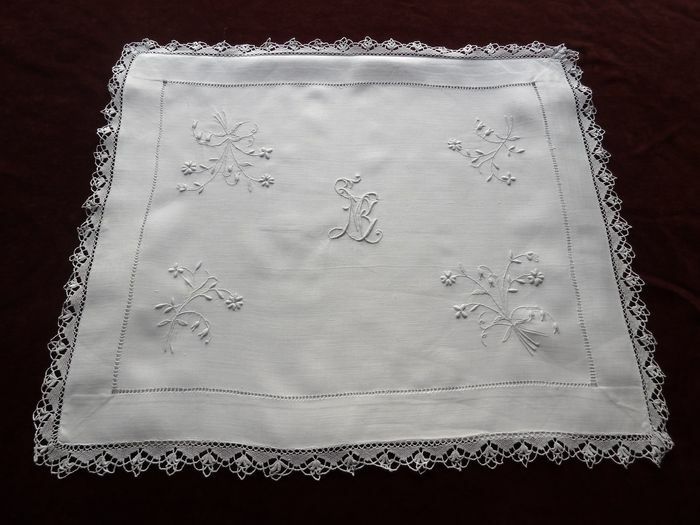 This romantic piece has a beautiful monogram "MB" finely embroidered in bourdon in the center of the cover flap and four exquisitely embroidered bouquets of flowers, each different, in each of the four corners. A delicate ladder-work hemstitch defines the edge and a lovely scalloped bobbin lace borders the piece. Likely dating from the turn of the 20th century, this lovely envelope is in pristine condition! Dimensions: 17.5 x 14.5in.